Like with Syria before, the headlines on Venezuela are moving much faster that the reality inside Caracas. Also like with Syria, pundits who have little to no awareness of what the Latin American country looks like on the ground will still arrogantly make their inflated prognostications from thousands of miles away from the Venezuelan streets. For this reason if some lone military attaché at the Venezuelan embassy in D.C. defects, it generates breathless headlines foretelling a supposedly imminent snowball effect of mass army defections: Losing Grip on Power... one ABC headline excitedly stated after the officer's declaration of support for Juan Guaido. Will we still be told "regime collapse imminent!" in Venezuela a year or two from now? As was the case for years running with Assad? Indeed the Syria-Venezuela parallels are striking, but it's perhaps more a story of the mainstream media's ignorance and conceit, or it could in some cases be mainstream journalism jumping on the Washington psyop band wagon: prematurely creating an atmosphere of paranoia and fear that regime collapse is imminent can help induce those very conditions. As hundreds of thousands of his citizens took to the street demanding his departure, governments everywhere called on the president to step down. Neighboring states absorbed those who fled, creating a refugee crisis. Its oil was embargoed, its embrace of socialism derided. “This regime is the equivalent of a dead man walking,” a top U.S. official told Congress. Actually there were plenty of analysts around who got Syria right from the beginning, but mainstream discourse tended to push them to the side in favor of sensationalism, moralistic fake romanticized narratives, and wishful thinking. Amidst a flurry of current hyped reporting that sounds cocksure Maduro's swift exit will occur at any moment, Bloomberg takes a moment to urge caution: "And while the odds remain high that Maduro will be driven out — perhaps even quickly — the parallels with Assad and Syria are worth pondering as a cautionary tale." 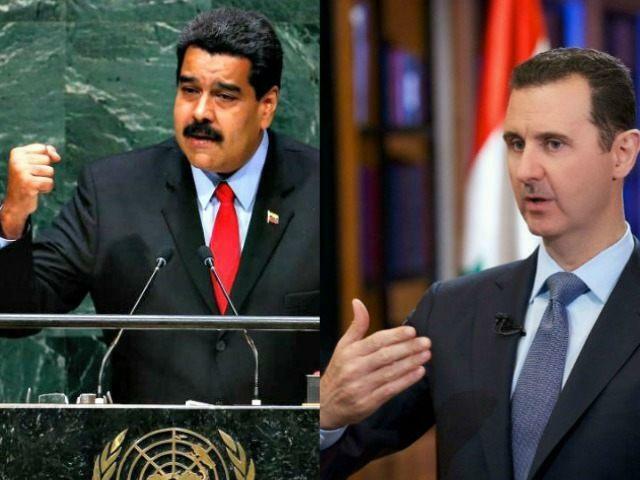 The report adds another key parallel that like with Syria before could make a huge difference in the Maduro government's fate: "The only significant country pledging backing for the regime is Russia," remarks Bloomberg. The key factor could be economic, as oil remains the biggest — we could almost say sole — source of revenue for Caracas. Bloomberg concludes on this point, "Unlike Syria, the Venezuelan state relies for income almost exclusively on oil sales, especially to the U.S., and Washington’s recently announced boycott could prove crippling." The oil factor indeed could make all the difference; however, as is also the case with Syria, the people on the streets will surely feel the pain and full impact of sanctions long before the corrupt elites in Caracas go down.